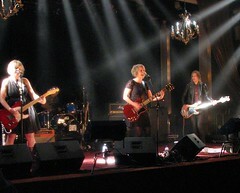 San Francisco's The May Fire has a certain sort of Sonic Youth/Sleater-Kinneynity (Sleater-Kinnectivity?) that while not unique, is surprisingly pleasing in a familiar sort of way - like accidentally discovering that the bistro down the street makes pasta that tastes almost like mom used to make. The May Fire's newest EP, "The List," released today, is actually the third installment of a trilogy of bite-sized offerings. Having not actually heard the previous two EPs, I'm only left to assume that this album has context in a measure of the whole… whether that's a reasonable assumption, I don't know. What I do know is that this particular fuzzy, noise rock offering is fun, a nice summer riot enjoyably reminiscent of early 90's girl grunge. Lead singer Catty Tasso has a voice built for this sort of unpolished, raw rock - deep, scratchy and with modest range - and I mean that affectionately. I mean; it works. For the most part. The album has its flashes of talent and its occasional shades of mediocrity, but the whole offering is carried by the fourth track, "Under The Wave." After I've listened to the first three tracks and the fourth begins to fade in, I feel much as the parent of a "C" student who finally brings home an "A" paper who berates "This just proves you can do it. Now I expect you to get an 'A' every time." Unreasonable? Probably. But the "Under The Wave" track takes what would normally be just a passable EP and ramps it up a notch, proving that the May Fire, with a little more study, can yet become a band that ruins the grading curve for everybody else. Just two weeks short of 13 years since I'd first seen Polara, I visited Minneapolis' Varsity Theater to see if they were still the band I remembered so fondly. 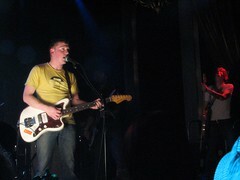 Their first opener, Mercurial Rage, performed an entertaining, if not amazing, electro-rock set. Being the fashionably late sort, I actually missed most of it, so it wouldn't be fair to judge them entirely, but I did see some potential there and certainly didn't dislike what I saw. The Faint meets INXS, perhaps. They seemed a bit like a work in progress. I'll definitely have to check them out again down the line. Thoroughly exploiting my weakness for co-ed punk were the Mood Swings. The Mood Swings are what I would call no-scream girl-punk. Sometimes I forget that female-vocalized punk can still have an edge and an energy without being angry or harsh (Though in all honesty: the good stuff is often both). This narrow-mindedness is no doubt due to stubborn attachment to my Bikini Kill, Babes in Toyland and Muffs collections. But anyway The Mood Swings were lovely. 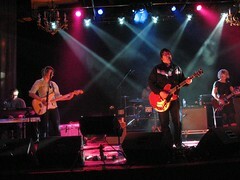 Check out myspace.com/themoodswings and listen to No Limit, my personal favorite. I think you'll find "Lovely" is an apt descriptor). Polara chose not to play last, instead allowing the Alarmists to take that spot, saying they would be able to more enjoy their release show that way. It had been over two years since their last live show, and I was impressed at how effortlessly they hit the stage running. No sign of rust whatsoever. Lead singer/guitarist Ed Ackerson took to the stage looking - with his disheveled hair and trademark clunky glasses - less like a rock star and more like someone at the IT desk who would help you reset your password. As a whole, the band looked both very natural on stage and very much as if they enjoyed themselves, soaking in the attention with humble professionalism. And why not? There were enough photographers darting back and forth in front of the stage to make me wonder when Posh Spice would make her appearance. It was a good set, actually even better than I remembered them and certainly well worth the hype. Then, at exactly midnight, it was time for my first glimpse of the Alarmists. I soon became aware that, like Cinderellas in reverse, dozens of 18 to 25-year old women had appeared as if from nowhere to join the ball, flooding forward in order to gaze in rapt attention at the poster-ready boys who took the stage. I thought their set was good, indie, post-punk hard rock - not typically conducive to legions of screaming girls, on the face of it - but as I attempted to peer over the impenetrable wall of Scandinavian female flesh, I could only arrive at one conclusion: these boys must be dreamy hot. The highlight of their set - the highlight for me anyway, and likely also for the male hipsters who had largely by this point retreated to a safe distance - was when they called Ed Ackerson back to the stage in an old(er) meets young(er) set evoking Neil Young with Pearl Jam. Don't roll your eyes at me. The song was Cinnamon Girl, OK? Alright then. Polara possesses what I consider the classic Twin Cities rock sound - distort guitars and crisp vocals which provide just enough of a radio-friendly pop-rock feel to appeal to the masses while retaining enough artistic originality to placate even the most snobby hipster (that's me). Some call it "noise-pop," others "psychedelic." I call it ear-candy. I call it bliss. I call it Saturday afternoons in spring 1995 spent writing e-mails to local bands begging them to "please play more all-ages shows." I call it vintage Minneapolis. Polara continues their long-standing relationship with the Susstones label with their first full-length since 2002, "Beekeeping," released today. (Incidentally: it's my opinion that Susstones is the most underrated Twin-cities-based label in business today). This album is simply quintessential Polara. Ed Ackerson, Jennifer Jurgens and Peter Anderson have turned out the kind of quality effort I've come to expect in every offering since their 1995 self-titled debut. With rockers like "E-Flat" and "Out Of Your Hands," Ackerson's agreeably sweet voice balances the guitar-work like the second spoonful of sugar in my deliciously powerful French roast. And like that coffee, it's filled me with a sort of heady euphoria that will have me buzzing around the neighborhood for hours. With 11 tracks coming in at a brisk 39 minutes, this album is a must-buy for any Minneapolis rock fan - or anyone wondering just what the hell I'm going on about all the time. 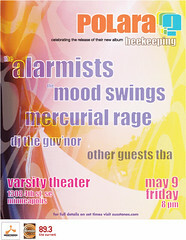 If you can; check out Polara's album release show at the Varsity Theater this Friday (May 9th). Fellow Susstones acts The Alarmists, The Mood Swings and Mercurial Rage open. I'm the first to admit my shameless devotion to the Minneapolis music scene, but Kid Dakota deserves special consideration. The product of singer / songwriter / guitarist/ engineer / all-around- dynamo Darren Jackson on guitar, keyboard and vocals, Kid Dakota also features drummer Ian Prince (formerly of Houston and the Dames and currently of Story of the Sea). Jackson, a South Dakota native, is also a producer in his own right, running a recording studio built into his house, where he has worked on albums by the Owls, Ice Palace and Vicious Vicious. Kid Dakota's third album "A Winner's Shadow," released March 11th, is an impressive effort that, while it could never be called poppy, on some occasions manages to just barely flirt with catchy refrains that - no joke - actually had me singing to myself as I woke up a few days ago. The album opens as an eerie pulse with "New York System" and howls a ballad with "Stars" before delivering a knockout punch with the distorted twang of "Chutes and Ladders," and despite the up-tempo vigor with which the album opens, it gradually progresses into a sort of sleepy despair, often lyrically evoking images of a cold but vibrant cityscape, all culminated with final tracks "Downhill" and "Fallout." Both are wails in the dark which particularly justify Darren Jackson's frequent vocal comparison to Thom Yorke. It is this voice which has provided (as all evidence indicates) the haunting soundtrack to my dreams these past few nights. Having recently caught Kid Dakota's live show, my respect for this band has become open admiration. Ian Prince is a beast on drums. There's just no other word for it. Beast. 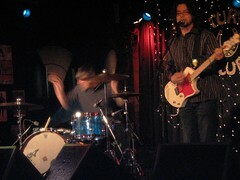 Pulling double-duty that evening drumming with Story of the Sea makes his superhuman energy all the more impressive. Those two definitely dial up an intensity in their live shows that could never truly be appreciated in a recording. Don't let that keep you from picking up this album, though - just do yourself a favor and see them live as well.